Since 2014, Kapur & Associates has been providing watermain design to Milwaukee Water Works (MWW) under our City of Milwaukee Master Contract. Our relationship with MWW began in 2012 with the design of 800 feet of 30” ductile iron water main including a jack and bore operation under I-94 as part of the Zoo Interchange design. This design overcame challenges including elevation drops in excess of 25 feet to get from access roads to elevations required for the jack and bore operation. All plans and specifications, estimates, permitting, and deliverables were completed in accordance to the standards of Milwaukee Water Works. Following this success, Kapur & Associates partnered with a national tunnel firm to investigate and deliver reports, plans, and repairs to the Linwood Tunnel connecting the Riverside pumping station to the Linwood Water Facility. This project, over 7,000 LF in length, removed more than 3.5 mil gallons of water from the tunnel, ventilated, and lit the length of the tunnel for inspection in a 36-hour window. Kapur survey staff provided horizontal and vertical control, alignments, scanning, and sectioning to insure tunnel integrity (roundness), while our inspectors evaluated 15 gates at both tunnel ends, and ventilation areas along the stretch of the 9’ high tunnel. 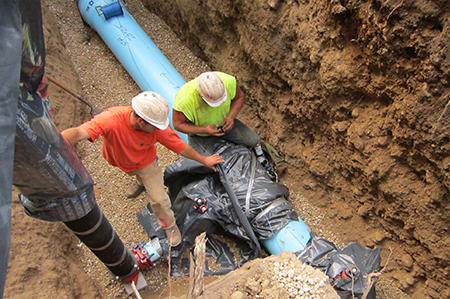 Additional projects followed, including task orders for the design and oversight of 20 additional water main projects on streets throughout the City. These include over 14,500 LF of new water main, as well as all coordination with Diggers Hotline, topography, elevations of all water facilities at the surface, data distribution for GIS, all plans, specs, and estimate, and coordination with WDNR.